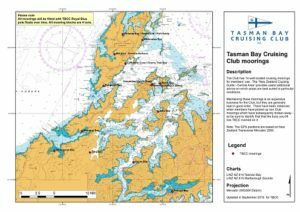 The Club has 14 well located cruising moorings for members’ use. 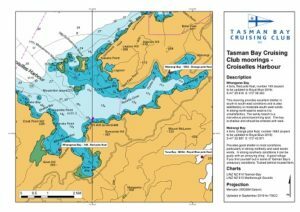 The “New Zealand Cruising Guide – Central Area” provides useful additional advice on which areas are best suited to particular conditions. Maintaining these moorings is an expensive business for the Club, but they are generally kept in good order. 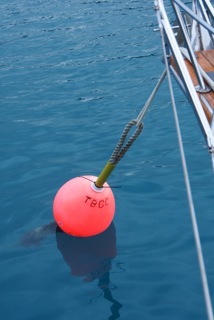 There have been instances when members have picked up non Club moorings which have subsequently broken away – so be sure to identify that the buoy you lift has TBCC marked on it. Note: The GPS positions are based on New Zealand Transverse Mercator 2000. The Club pennant, flag, or burgee must be flown when using any Club mooring. Moorings are available on a first come, first served basis to members only. The Club has not entered into any reciprocal arrangements with any other clubs or group regarding moorings. 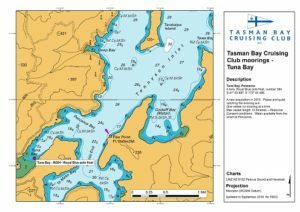 TBCC members have no rights to others’ moorings and no-one else has rights to TBCC moorings. If non-members are seen using our moorings they should be politely asked to move. If they do not, please report the vessel name and time details [photo very useful] to the Committee who will take appropriate action. The maximum length of any vessel using the mooring is to be no more than 18 metres/59 feet (on upgraded 4 ton moorings). The member first taking the mooring can choose whether to allow other members boats to raft up or not. If you wish to raft up to a member boat please seek permission first. 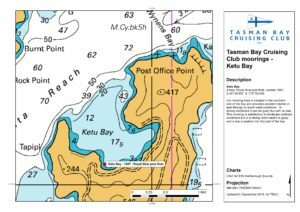 The resource consent restricts rafting to maximum of three vessels (max total 28 tons): in Cherry Tree Bay, only two vessels may raft together & in Tuna Bay only one vessel on the mooring at a time. The largest vessel should take the mooring. The Club accepts no responsibility for injury or damage resulting from boats rafting up on a mooring. Moorings are not available to commercial vessels excepting a boat under private charter to a member. Please give the top rope a scrub if it is becoming fouled: if the name on the buoy has faded, please freshen it up with paint or an indelible marker. Please advise the Club Manager if you find the mooring to be damaged or discover other problems. 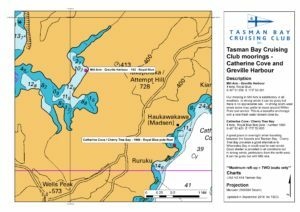 The chartlets illustrating the locations of the club moorings have been produced by club member Bruce Barton, using ESRI ArcGIS, the latitude and logitude of the moorings and Land Information New Zealand Charts from the LINZ Data Service (LDS). The chartlets are not to be used for navigation. This mooring provides excellent shelter in south to south-east conditions and is also satisfactory in moderate south-west winds. In strong north-east to west it is unsatisfactory. The sandy beach is a marvellous picnic/swimming spot. The bay is shallow and should be entered with care. Max vessel length 18m Mooring No. 149 – 4 ton block weight – Red pole float. Provides good shelter in most conditions, particularly in strong northerly and west sector winds. In strong southerly conditions it can be gusty with an annoying chop. 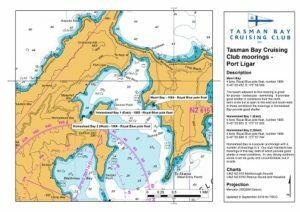 A good refuge if you find yourself out in some of Tasman Bay’s unsavoury conditions. Max vessel length 18m Mooring No. 1883 – 4 ton block weight – Pink pole float. Punganui is an excellent place to stop while waiting for the tide to change before negotiating French Pass. When approaching this mooring care should be taken as there are rocks to either side. Good shelter in all north sector winds although in strong north to north-west conditions a roll tends to set up. 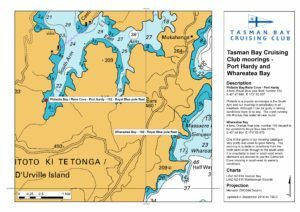 In southerly conditions it is better to anchor in Waikawa or Okiwi bays. Water available from a hose on bach, courtesy of the owner. Max vessel length 18m Mooring No. 151 – 4 ton block weight – Orange pole float. Our mooring in Mill Arm is satisfactory in all weathers. In strong winds it can be gusty but there is no appreciable sea. In strong south-west winds some may prefer to move around Wiffen Point and anchor. This is a beautiful anchorage with a nice fresh water stream close by. Max vessel length 18m Mooring No. 153 – 4 ton block weight – Orange windy + yellow. Philante is a popular anchorage in the South Arm and our mooring is satisfactory in all weathers. Although it can be gusty in strong conditions there is no sea. The creek running into this bay has water all year round. Max vessel length 18m Mooring No. 152 – 4 ton block weight – Blue pole float. One of the gems in our mooring catalogue – very pretty and close to good fishing. This mooring is suitable in conditions from the north semi-circle through to the south-west. It is unsuitable in east or south-east winds. 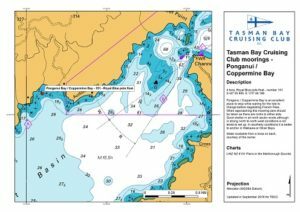 Members are advised to use the Catherine Cove mooring in south-east to easterly conditions. Max vessel length 18m Mooring No. 150 – 4 ton block weight – Orange pole float. A great place to overnight when travelling between the Sounds and Tasman Bay. Cherry Tree Bay provides a good alternative to Whareatea Bay in south-east to east winds. Good shelter is provided in all conditions but in strong winds, particularly from the north-west, it can be gusty but with little sea. Max vessel length 18m Max number to raft-up: TWO only Mooring No. 1990 – 4 ton block weight – Orange pole float. The beach adjacent to this mooring is great for picnics – barbecues – swimming. It provides good shelter in conditions from the north semi-circle but is open to the east and south-east. In these conditions the moorings in Homestead Bay provide good shelter. Max vessel length 18m Mooring No. 1884 – 4 ton block weight – Blue pole float. Homestead Bay is a popular anchorage with a number of moorings in it. Our club maintains two moorings in this bay, both of which provide good shelter in most conditions. In very strong northerly winds it can be gusty and uncomfortable, but it is safe. Max vessel length 12m. Mooring No. 1885 – 4 ton block weight -Blue pole float. Homestead Bay is a popular anchorage with a number of moorings in it. Our club maintains two moorings in this bay, both of which provide good shelter in most conditions. In very strong northerly winds it can be gusty and uncomfortable, but it is safe. Max vessel length 18m West Mooring No. 1886 – 4 ton block weight – Blue pole float. 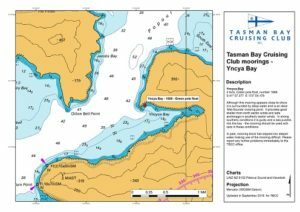 Our mooring here is situated in the southern end of the bay and provides excellent shelter in east through to south-west conditions. In strong conditions it can be gusty but with no sea. This mooring is satisfactory in moderate northerly conditions but in a strong north-west it is gusty and a sea is pushed into this part of the bay. Max vessel length 18m Mooring No. 1887 – 4 ton block weight – Royal blue pole float. Although this mooring appears close to shore it is surrounded by deep water and is an ideal ‘Mid-Sounds’ mooring point. It provides good shelter from north sector winds and safe anchorage in southerly sector winds. In strong southerly conditions it is gusty and a sea pushes into the bay – the mooring should be used with care in these conditions. Max vessel length 18m Mooring No. 1888 – 4 ton block weight – Green pole float. This mooring is an asset for members wanting to socialise at the hotel without using the Marina. 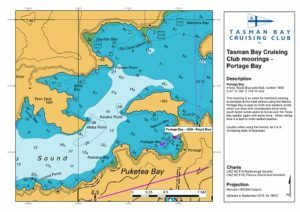 Portage Bay is open to north and westerly winds, which can blow with considerable force while south sector winds seem to funnel over the Torea Bay saddle, again with some force. When calling here it is best to order settled weather. Caution when using the marina as it is in an increasing state of disrepair. Max vessel length 12m Mooring No. 1889 – 4 ton block weight – Blue pole float.